Does the Chamber issue business licenses? 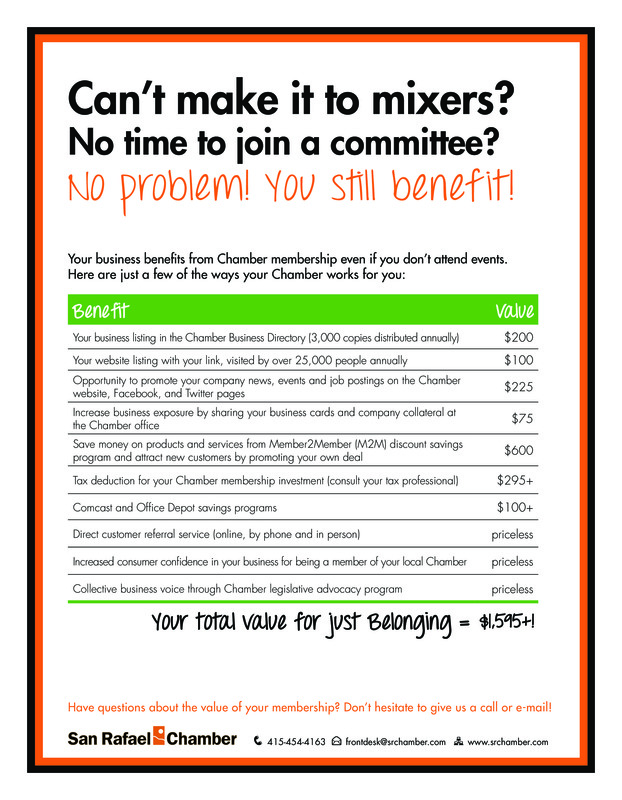 What is my membership worth if I don't attend Events or sit on Committees? The San Rafael Chamber of Commerce is a member-based business advocacy organization providing a strong voice in support of the economic vitality of our community. The Chamber has about 570 members. You can access information about our membership via our membership directory. Membership dues are based on the number of employees your business has. Click here to view our membership application, which includes a dues schedule. The Chamber is not part of the government. We are an independent, non-profit 501c(6) corporation. The San Rafael Chamber is an independent 510c(6) organization. The San Rafael Chamber of Commerce believes that a healthy business community is invaluable to the community as a whole. The Chamber tracks local, state and federal issues impacting business and maintains close contact with city, county and state legislators to promote beneficial business legislation and discourage detrimental regulations. The San Rafael Chamber is affiliated with two Political Action Committees (Issues and Candidates). Both PAC's are independent legal entities supported by, but independent of the San Rafael Chamber of Commerce. The PACs are voluntary, non-profit, unincorporated Sponsored, General Purpose Committees. The PACs are independent of any political party, candidate or political organization. The Chamber established the PACs to serve the function of promoting the improvement of the Greater San Rafael area through an active participation in the political process. At all times the PACs will strive to be a positive influence on that process in the support of individuals or issues that share a common view on our community needs. The Chamber PACs will endorse and support candidates for office and take positions on issues of substance impacting on the San Rafael community. It is recognized that the PACs are founded on the principle that a healthy business community provides jobs, a tax base and opportunities to the overall community and, as such, it is an important aspect of the PACs to promote the health of the Greater San Rafael business community. The Chamber does not issue business licenses, but we are happy to help connect you with the correct resources in the city government. For business license information, please call the City of San Rafael's Economic Development agency at 415-485-3051. The San Rafael Chamber of Commerce is happy to help make your grand opening and/or ribbon cutting a success for your business. To host a ribbon cutting or grand opening at your business, please review this application and guidelines document. Please call 415-454-4163 or email frontdesk@srchamber.com with any questions. To assist members in marketing their products and services to each other, Chamber members can purchase, in label format, a list of all San Rafael Chamber current members. Please click here for more details about this direct promotional opportunity, and call 415-454-4163 or email frontdesk@srchamber.com with any questions. There are also opportunities to promote your business in our E-Newsletters, which reach over 1200 people in our community. Click here for information on how to advertise in our electronic publications. What is my membership worth if I do not attend events? If you do not participate in networking opportunities, your business still benefits. A 2012 Schapiro Group Research Study of 2000 adults reveals that being a member of a local chamber of commerce is an effective business strategy because two-thirds of consumers believe that such companies use good practices, are reputable, care about their customers, and are involved in the community.